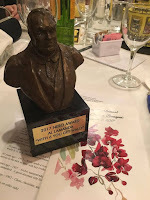 The Nero Award is presented each year to an author for the best American Mystery written in the tradition of Rex Stout's Nero Wolfe stories. It was presented by The Wolfe Pack this past weekend at the Black Orchid Banquet in New York City. The "Nero" is considered one of the premier awards granted to authors of crime fiction. This year's winner is Al Lamanda for With 6 You Get Wally (Five Star). The Wolfe Pack, founded in 1977, is a forum to discuss, explore, and enjoy the 72 Nero Wolfe books and novellas written by Rex Stout. The organization promotes fellowship and extends friendship to those who enjoy these great literary works of mystery through a series of events, book discussions, and a journal devoted to the study of the genius detective, Nero Wolfe, and his intrepid assistant, Archie Goodwin. The organization has more than 500 members worldwide. For further information, please see www.nerowolfe.org. Congratulations Al, so proud to know and respect your writing. Thanks for all the books you have given me to read over the years.